﻿ Ricardo Carvalho: "Cristiano Ronaldo is strong and will react well"
16.09.2011 » Ricardo Carvalho: "Cristiano Ronaldo is strong and will react well"
Ricardo Carvalho was the chosen player for an interview in Real Madrid TV and talked about Cristiano Ronaldo recent controversy, as well as his own incident in Portugal, that led him to retire from the Portuguese National Team. Ricardo Carvalho granted an interview to Real Madrid TV, and spoke about a few recent and controversy topics, such as his retirement from the Portuguese National Team, but also the latest incident involving Cristiano Ronaldo in the game between Real Madrid and Dinamo Zagreb, for the UEFA Champions League. That last game which Real Madrid won by 0-1, with a precious goal by Angel Di Maria, was precisely the starting point of this interview. Several Real Madrid players and staff complained about the excessive aggressiveness put in play by Dinamo Zagreb men and pointed the finger to the referee, for having double standards and being too complacent. Ricardo Carvalho: "We felt like we didn't receive a fair treatment in that game, specially having in mind that play where Marcelo got sent off. But the truth is, we have to remain calm in those moments." said the experienced Portuguese player before approaching what happened with Cristiano Ronaldo. Ricardo Carvalho: "Cristiano Ronaldo was feeling a lot of pain because of the tackle and injury he picked during the game. It's normal that in those circumstances he gets upseted and outraged with what's happening. A great player as Ronaldo should always be protected. Cristiano Ronaldo is strong, but there were a few tackles that could have been avoided." The Portuguese player has already won the UEFA Champions League in F.C. Porto, at the same time José Mourinho was coaching the Portuguese club. Ricardo Carvalho then added on Ronaldo: "Great players as him should always be fit to play, for the sake of fooball. However, Cristiano Ronaldo suffers a lot of fouls and tackles and it's inevitable that he resents from it, but he'll react well and overcome it." Regarding the controversy that ended up with his decision of retiring from the Portuguese National Team, Ricardo Carvalho noted that it was a very hard moment in his career: "The Portuguese people know what I feel towards the country and the pride I have in wearing that jersey. I deeply love my country, Portugal. Everyone makes mistakes, but I'm very proud in being Portuguese and putting that shirt on. My children could have born in England, since I was playing in Chelsea by that time, but I insisted for them to give birth in Portugal. Everything that happened is an uncomfortable situation, but I love Portugal. A few interesting facts were revealed in the full version of this interview, but we outlined the most peculiar ones. Ricardo Carvalho admitted a man also cries and he confessed that happens with him as well: "I cry when I suffer from people being unfair with me. However, I only care about people who are truly important to me. That's why I suffer a lot and cried a lot, but not because of those who I don't care about. In the other hand, I cried a lot when my children were born." Ricardo Carvalho still talked about his hobbies and his favorite movie of all-time: "Braveheart. I've seen it several times and Mel Gibson is my favorite actor." 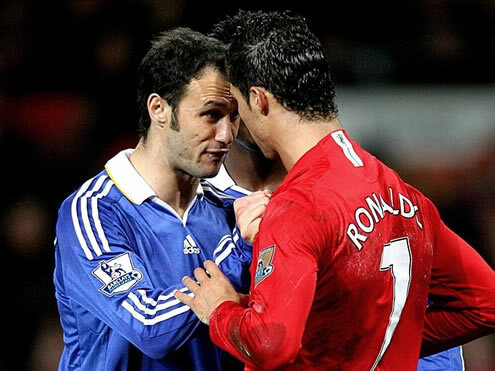 Before ending, Ricardo Carvalho referred to José Mourinho as a very important person in his career: "Mourinho is one of those guys who really leaves a mark on people, because he's always honest and direct. He says what he thinks and he always manages to pass his message. There's no turning point after he says what he wants. We never turn against him, because we all know the way he truly thinks. Mourinho is the best coach I've ever had. He always wants the best for the team and he does everything he can for that to happen." Cristiano Ronaldo was recently seen as a peacemaker in the Ricardo Carvalho and Pepe supposed misunderstanding, due to what happened in the Portuguese National Team, but Carvalho denied all the rumors of a bad relationship with Pepe. Ricardo Carvalho: "Those who truly know me, are aware that Pepe respects me and that I respect him as well. He's a great guy, fun to be with and who helps a lot when someone needs. He also had a serious problem in Real Madrid in the past and he holded on. I've already thanked him for always being at my side. It's a great pleasure to play side by side with him and he's at a great shape. He's a bit less calm than I am, but he's still a top player." joked Ricardo Carvalho about his teammate. One of the new pages we opened this week regards Cristiano Ronaldo son. You can there collect information about Cristiano Ronaldo Jr. and also watch some of his photos. Don't forget that besides following Real Madrid match this weekend, you can also watch Manchester United vs Chelsea streaming on Sunday. Real Madrid next opponent in La Liga is Levante, in the 18th of September. You may watch Levante vs Real Madrid live, inside our Live Games Streams section. Cristiano Ronaldo picked up an injury in Croatia, so there's still no information regarding if CR7 will play against Levante. The countdown clock timer, displaying the time left for the next Ronaldo game, is shown on the top right corner of all pages. As a bonus, you can also watch Barcelona vs Osasuna in one of the new live streams pages we've added.